Home grown is always best and today you can learn how to grow your own Kiwi Fruit from seed with the easy to follow video tutorial. You will love the results. If you love Kiwi Fruit, now you can learn how to grow Kiwi Fruit from seed. The good news is it is very easy when you know how! Before we get into the process, did you know that Kiwi Fruit is also referred to as Chinese Gooseberry? You can actually regrow kitchen scraps and other fruits too. We also have recently shared how to grow a lemon tree and avocado from seeds too. Before we check out how to grow a kiwi plant from seed we thought we would share this infographic from Stylecraze that outlines all the many benefits associated with this popular and delicious fruit. They fight acne, rejuvenate your skin and promote cell generation. They also prevent sun damage and lighten dark circles. Kiwi Fruit is excellent for your digestive system, aids weight loss and prevents respiratory disorders too. 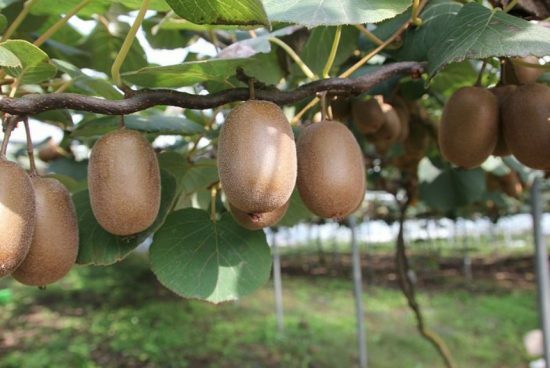 You can train your kiwi fruit onto a pergola, fence or up a tree in warmer climates. It’s important to remember that they can get quite heavy. Be sure to keep that in mind. It is suggested that Fruit should appear after 2 – 3 years. You will need to have some patience but it’s worth the effort. The home grown version will be much sweeter than Store bought. We have included a video tutorial that shows you how to grow a Kiwi Fruit from Seed at home. 1. Remove the seeds from your Kiwi Fruit. 2. Remove the sticky membrane from your seeds. 3. Wash your seeds carefully, a colander works well. 4. Pop seeds on a damp paper towel and insert into a plastic ziploc. 5. Find a nice warm spot for your seeds. 6. Check in daily watching for signs of sprouts and ensure that the paper towel stays moist at all times. 7. Transplant sprouted seeds into a small pot.